For his unselfish and outstanding service, his extensive advice to international Arctic sailors, and his remote support of yachts sailing the Northwest Passage. 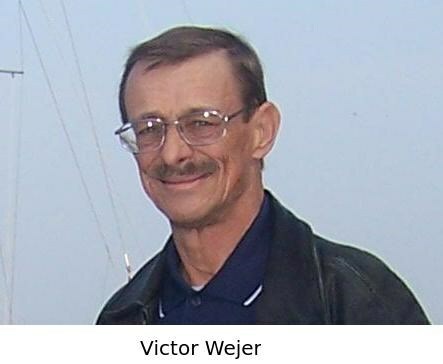 Canadian Victor Wejer has been instrumental in the success and safety of many transits of the Northwest Passage. Victor has provided free weather, ice and routing advice to many yachts (42 from 2006-2016), including the first to transit by way of Fury and Hecla Strait (2016). He has provided critical information and expertise without any recompense to those who have approached him for advice, as well as cautioning the dreamers and the unwary concerning a dangerous undertaking. He takes an interest in voyagers in the NW Passage. To many, he is a friend as well as an advisor, taking into account crew and vessel strength. An example of Victor's invaluable advice is quoted from an early communication to an OCC member: "I have gotten many calls from different adventurers wanting to make the NW crossing. For most I strongly advise them to stay away. One has to have the correct mindset. This is not an adventure, it's a dangerous trip for the unprepared. A perfect crossing will have no story to tell at the end. No problems. No issues. No disasters. All ice openings are taken advantage of. As one Arctic explorer used to say 'adventure is a sign of incompetence.'" Over the years Victor has collected information concerning methods, shelters, anchorages, ice conditions and equipment from voyagers who have succeeded as well as those who have failed in their attempts to sail this unique and often unpredictable passage. Victor has collated various accounts to create a truly valuable body of work which he updates and regularly shares. His Yacht Routing Guide can be downloaded from the RCCPF website.